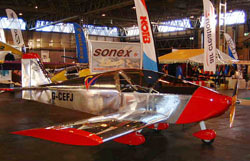 Sonex Flies in the United Kingdom! Sonex Aircraft, LLC is pleased to announce that we have awarded dealership status to Silver Fern Microlights, Ltd. in the United Kingdom. Sonex SN 887, a Jabiru 3300 powered, Tri-Gear, Dual Stick Sonex built by Mike Moulai of Silver Fern Microlights, made its first flight on December 16. The aircraft will begin its PFA flight test period and PFA approval of the design is expected in the Summer of 2007. Popular Flying Association (PFA) approval of a sport aircraft design is prerequisite to UK Civil Aviation Authority aircraft registration. Silver Fern Microlights has made a significant investment toward securing PFA approval of Sonex designs which will allow other UK pilots to build and fly this popular homebuilt aircraft. All orders from UK customers may be directed to Silver Fern Microlights. Sales and Informational inquiries, as well as Technical Support inquiries may still be made directly to Sonex Aircraft, LLC.